1 x Oil Pressure Gauge. Numbers and pointer clearly show the oil pressure, oil temperature and water temperature. 1 x Oil Temp Gauge. 1 x Water Temp Gauge. 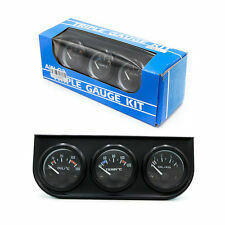 Car Gauge Kit. Oil Temp Gauge Size 41 x 52mm/1.6" x 2"(H D). 2" 52mm Oil Press Gauge. Pointer color: Red. 1 X Oil Press Gauge. 1 X English Instructions. 1 X Sensor. Trending at $14.72eBay determines this price through a machine learned model of the product's sale prices within the last 90 days. 2" (52mm) Oil Pressure Gauge. Features LED Lit Back Ground For Even Lights Distribution. We can provide minimal support, but we will try our best to help. Canada and International Countries. 2" (52mm) Oil Pressure Gauge. Smoke-Tinted Lens. We can provide minimal support, but we will try our best to help. - Canada and International Countries. 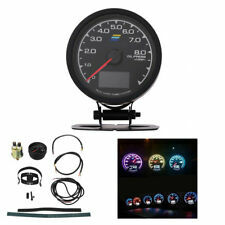 2" (52mm) Oil Pressure LED Gauge. Color: Blue LED. NOTE : All of turbo parts and performance may require slight modification in order to fits perfectly. We can provide minimal support, but we will try our best to help. Red Illuminated Needle. 2" (52mm) Oil Pressure Gauge. Features 7 Color Display LED Lit Back Ground For Even Lights Distribution. NOTE : All of turbo parts and performance may require slight modification in order to fits perfectly. 2" (52mm) Oil Pressure Gauge. Features LED Lit Back Ground For Even Lights Distribution. NOTE : All of turbo parts and performance may require slight modification in order to fits perfectly. We can provide minimal support, but we will try our best to help. 2" (52mm) Oil Pressure Gauge. Features 7 Color Display LED Lit Back Ground For Even Lights Distribution. User must follow the direction given and any misuse of this product is at his/her own risk. Canada and International Countries. 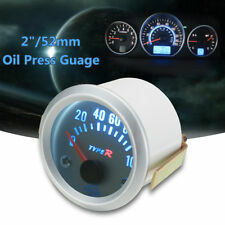 2" (52mm) Oil Pressure LED Gauge. Color: Blue LED. Great for Turbo Applications. User must follow the direction given and any misuse of this product is at his/her own risk. NOTE : All of turbo parts and performance may require slight modification in order to fits perfectly. 2" 52mm Oil Press Gauge. Pointer color: Red. 1 X Oil Press Gauge. Detail Image. 1 X English Instructions. 1 X Sensor. Gauge Height: 3.2cm. Pressure Range: 0~80 P.S.I. Color: Black Face. Detail Image. -Instruction is not included. Trending at $9.68eBay determines this price through a machine learned model of the product's sale prices within the last 90 days. 2" (52mm) Oil Pressure Gauge. Red Illuminated Needle. Features LED Lit Back Ground For Even Lights Distribution. Canada and International Countries. P.O. BOX, PR, HI, AK, APO, FPO. Gauge Height: 3.2cm. Pressure Range: 0~80 P.S.I. Color: Black Face. -Instruction is not included. This no-exceptions policy ensures the quality of the components you receive. 2" (52mm) Oil Pressure Gauge. NOTE : All of turbo parts and performance may require slight modification in order to fits perfectly. We can provide minimal support, but we will try our best to help. Canada and International Countries. 2" (52mm) Oil Pressure Gauge. Canada and International Countries. 2" (52mm) Oil Pressure Gauge. Features 7 Color Display LED Lit Back Ground For Even Lights Distribution. NOTE : All of turbo parts and performance may require slight modification in order to fits perfectly. 2" (52mm) Oil Pressure Gauge. Features 7 Color Display LED Lit Back Ground For Even Lights Distribution. We can provide minimal support, but we will try our best to help. Canada and International Countries. It has visual display, high accuracy, low power consumption, good stability, strong anti-vibration performance and wide application range (12V/24V). It has the characteristics of convenient installation, long service life and complete protection function. Red Illuminated Needle. 2" (52mm) Oil Pressure Gauge. Canada and International Countries. Fuel gauge cable must connect with Resistive Induction sensor(only work with this kind sensor). Oil pressure sensor thread:NPT8/1. 1 oil pressure sensor. Water temperature sensor thread:10MM. 2" (52mm) Oil Pressure Gauge. Features LED Lit Back Ground For Even Lights Distribution. User must follow the direction given and any misuse of this product is at his/her own risk. Canada and International Countries. 52mm / 2in. 2in1 Portable Car Engine Warehouse Cleaner Washer Gun Dust Blow Oil Washer Tool. 2.5M DIY Dual Colors Car Bumper Skirts Strip Protector Rubber Splitter Lower Lip. Power: DC 12V professional. 2" (52mm) Oil Pressure Gauge. Smoke-Tinted Lens. Features 7 Color Display LED Lit Back Ground For Even Lights Distribution. Canada and International Countries. P.O. BOX, PR, HI, AK, APO, FPO. Oil Pressure sensor:1/8 NPT. 1x Oil Pressure sensor. Ambient temperature: -10℃-50℃. Temperature Sensor Screw:M10. Suitable for Car,Motorcycle or by your need! New Universal With Rubber Protector Car Easy Access to Car Rooftop with Safety. Car Truck Portable VC309 OBDII/EOBD Code Reader Diagnostic Tool With Dictionary. Portable 14mm Autos Truck Spark Plug Re-thread Cylinder Threads Repair Tap Tool. 2 Pcs Shark Teeth Mouth Pattern Car Vehicle Decoration Reflective Vinyl Stickers. 2" (52mm) Oil Pressure LED Gauge. Color: Blue LED. Great for Turbo Applications. User must follow the direction given and any misuse of this product is at his/her own risk. Canada and International Countries. Oil pressure sensor ： M14 x1.5;. Sunshield design for better display. Car Auto SUV Glass Scrach Cerium Oxide Powder With 4 x Wood Polishing Wheel 230g. 230g Cerium Oxide Powder & 4 Wood Polishing Wheel Set For Car windshield Scrach. Size :57mm 52mm 38mm. Racing look enhance the characteristic to your car. 1 x Oil Press Pressure. (The compatibility just for reference. We will reply you within 24- 48 hours. ). The look enhance the characteristic to your car. (The compatibility just for reference. The button on the lens can switch the color of light you want. Universal 110V Dent Removal Tool Set Heating Machine For Car PDR007 Dent Repair. ). Smoke Tint Lens, Red Illuminated Needle，clear and bright LED Display during the night.LED super bright display. Racing look enhance the characteristic to your car. (The compatibility just for reference. ). 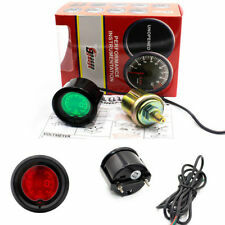 Regulator Black-Red fuel pressure gauge. -Adjustable Fuel Pressure Regulator with 1:1 Ratio. -Injected Bypass Fuel Pressure Regulator with -6 AN Inlet And -6 AN. -Oil-Filled Design Fuel Pressure Gauge for Maximum and Consistent. Oil Pressure sensor：1/8 NPT. 1x Oil Pressure sensor. Suitable for Car,Motorcycle or by your need! We will reply you within 24- 48 hours. Fuel gauge cable must connect with Resistive Induction sensor(only work with this kind sensor). 5 functions in 1. Oil pressure sensor thread:NPT8/1. 1 oil pressure sensor. Water temperature sensor thread:10MM. 2 Functions in 1. 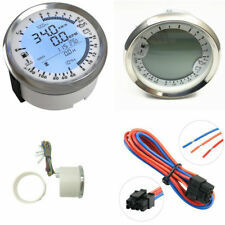 Oil pressure sensor ： M14 x1.5;. Universal fit for 12v 24 power car truck etc. DIY 5M/16.4ft Blue 3mm Car Silicone Vacuum Tube Hose Soft Tubing Pipe Universal. 2 X Silver Car Marine Stainless Steel Cup Drink Bottle Holder Base Kit Universal. Red Illuminated Needle. 2" (52mm) Oil Pressure Gauge. We can provide minimal support, but we will try our best to help. Canada and International Countries. Size :57mm 52mm 38mm. 1 x Oil Press Pressure. The button on the lens can switch the color of light you want. Racing look enhance the characteristic to your car. (The compatibility just for reference. ).